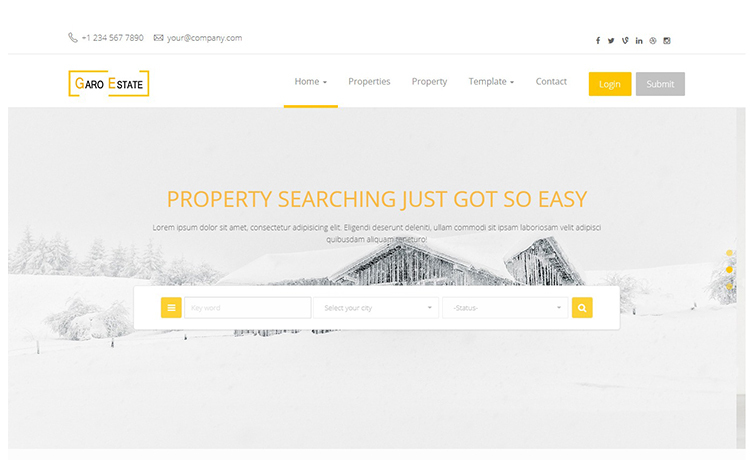 If you are in search of a template for real estate company which is built with Bootstrap, super responsive, well documented yet free, you are in luck! 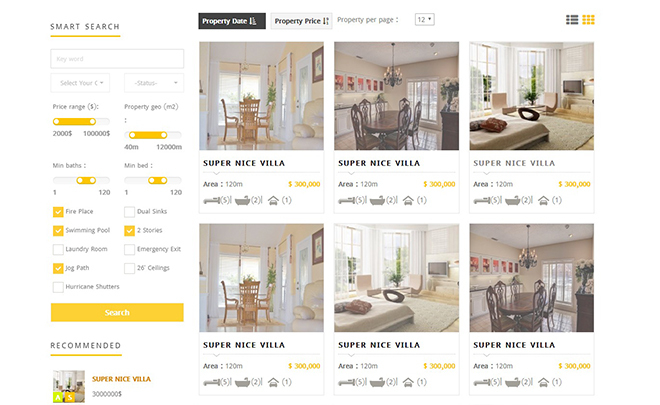 Brand new “Garo estate” template has arrived which is a Free HTML5 Real Estate Template. This template can be used for both real estate agents and property owners. 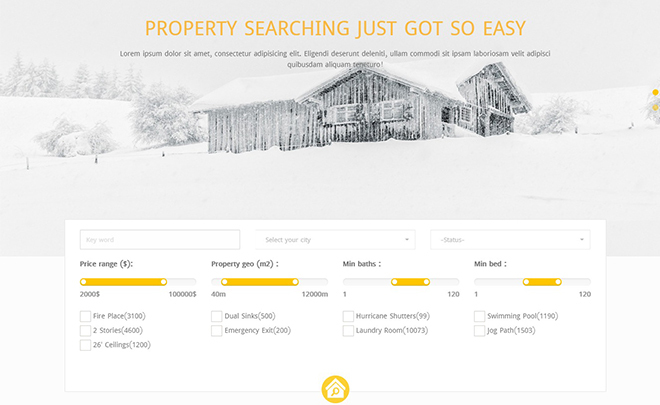 A clean and simply designed template like this is just perfect for selling Villa, Apartment, Land, Houses and more. Most interesting part? “Garo estate” is free and open for you to use! The template’s design enables you to use this on a website for real estate agents or property owners. You will get social media icons, easy search panels, several homepage styles, Email subscription form, visitor counter right the moment you download it. 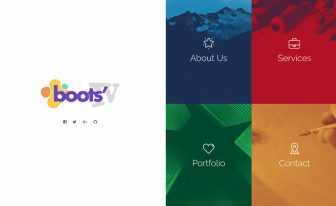 It’s eye catchy color scheme with a clean and simple UI allows you to design your website as you want it. For the new users creating a website might need a lot of effort. 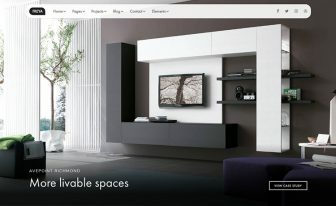 But this Free HTML5 Real Estate Template is designed such a way that you feel comfortable while using. You need not worry about the expenses, this template is completely free. 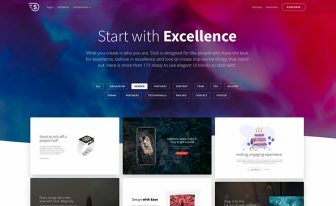 As a result of the previous feature, this template is one of the most responsive templates available when compared with other related templates. Any viewer from any devices, be it desktop, smart-phone or tablet, will have a perfect view of the website. This template’s design keeps the mobile-ready concept in mind. Thus, it’s quite easy to navigate all-throughout. You can check the responsiveness at Am I Responsive. Everyone wants their web pages to be in the top position of the Search Engine Result Page (SERP). As Garo Estate has SEO optimized code base and functions, it enables your website to be indexed by search engines like Google, Bing, Yahoo and give them the quickest rank in the SERP. SEO-readiness can certainly increase the odds of your success. Moreover, for the responsive layout, Garo estate has a super mobile-friendly environment. Meaning, this Free HTML5 Real Estate Template never fails to impress a visitor even he is from a mobile device. Check the mobile-friendly behavior of Garo Estate here. For a website to be able to support all the web browsers, cross-browser compatibility is a must. It gives the site the ability to look same in every modern web browsers eliminating all possible errors. As a cross-browser compatible template, Garo Estate is prepared with great caution to get automatically adapted in all most widely used browsers. Last but not the least, for a real estate website nothing short of excellence, will be good enough. 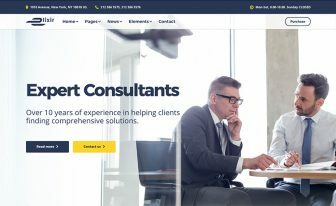 This Free HTML5 Real Estate Template makes life easier for the creator of a beautiful real estate website. So why is the delay? Download it for free now! 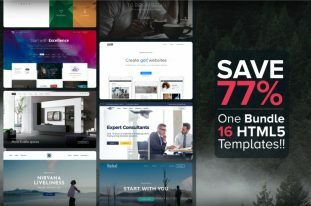 You can also browse all premium templates and free responsive templates offered by Themewagon. For instance, Hideaway is a stunning template carefully crafted for your luxurious Resort or Inn website. The documentary of this template is so good !!! No IDX-What good is it for a real estate agent? Great for anyone else, however. I can be use in my client site beside real estate agents and property owners? I have confused this sentence "This template can be used for both real estate agents and property owners"
Thanks for your topic, you could tell me how to make contact forms work. There are a lot of online tutorials and YouTube vedio tutorials available to do that. Please go through one of them. Please write your problem in English. Is it possible to add fields, such as one for external web links and for the MLS number? Also…how do we log into the admin/backend area of the demo? can we make this template into software and sell it? Nice template! One question: On the user-properties.html page, the images in the property listings do not size to scale but get very narrow when viewing on a phone. How can I fix this? One Question: The link to the licence says that I need to put a copyright notice on every page of the website and I need to indicate changes. How do I indicate the changes? I change a lot, do I need to mark everything? Brother, due you have any biding php template for biding purposes? If yes then please reply me. 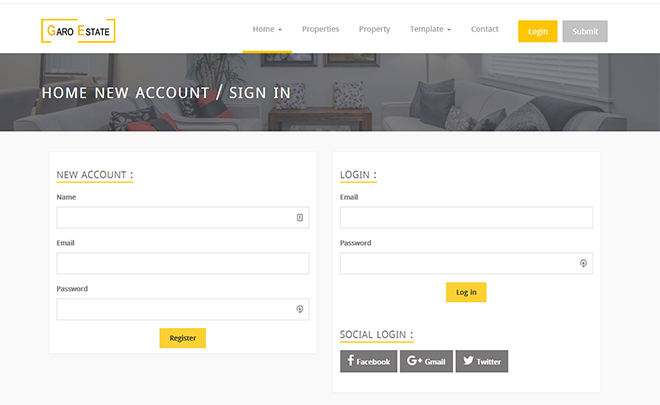 Can I get documentation for the next Garo Estate – Free HTML5 Bootstrap Multipage Real Estate Template? It’s a third-party template. Can’t assure you about the next update. hi like to use this template but could you please tell me how the search option can work properly right now its not. how can i change the theme color? I will use it well. Please send an email to info@themewagon with your queries. Thanks. Very nice I need to make portal like zameen.com can you help me. and what does it cost. Muchas gracias muy bonita y atractiva. De nada. Les deseo lo mejor también. Is there a document for installation and configuration? Where do I insert a property from? Where do I insert an agent from? Free templates usually don’t have a documentation. Do it yourself. can i use it commercial purpose? I cannot download this template! help…! I can be use in my client site beside real estate agents and property owners? can i use this template for commercial purpose or modify the source code? You can not resell or redistribute. You can use it in your client’s site though. Thanks for using ThemeWagon’s template.